This spectacular small bushy tree produces a profusion of large white flower bracts that slowly adopt pinkish hues as they mature. Cornus kousa var. chinensis flowers in May and June, so later than Cornus florida varieties. The foliage is oval with a pointed tip and dark-green in colour. It turns vivid orange and red in autumn, when small edible (but insipid) pink fruits are also produced. Cornus kousa var. chinensis prefers to be planted in a sunny position avoiding poor or shallow soils, but will still do well in partial shade. 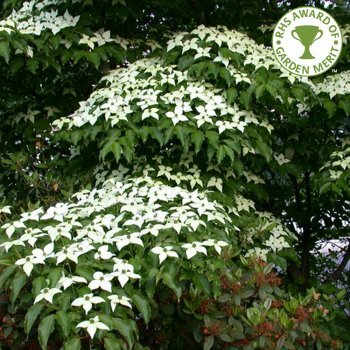 This small Flowering Dogwood tree has an estimated height and spread of just 3 x 3 metres, but will not fail to impress in any garden. Our pot grown Chinese Dogwood trees can be planted at any time of the year. Start by removing weeds and grass within a metre of your desired planting hole, then dig a square hole as deep as your root mass and roughly 1.5x as wide. To help the plant establish, sprinkle Mycorrhizal Fungi in the hole. Gently loosen the roots and place into the planting hole. Using 50% of the original soil and 50% compost, fill in the hole and firm around gently, making sure not to bank the soil up around the collar of the tree. For further information, visit our help and advice section. If you’re planting Chinese Dogwood in spring or summer, water well and regularly for the first few months. Take care to water the soil, not the leaves which can lead to scorching - irrigation kits make this easier. Increase watering in extended periods of hot or dry weather, but avoid over watering as Dogwood does not like wet soil. If you’re planting in autumn, you may only need to water a little. Once planted, keep the area free of competing weeds and grass for the first few growing seasons. Don't mulch around the base of Chinese Dogwoods with bark. Most Chinese Dogwoods naturally grow into an appealing dome-shape, so the only pruning required is to remove any damaged or diseased branches. The only time to hard prune a Dogwood tree is to control the overall size or internal canopy or if there is not enough light reaching the inner branches. To help ease these issues, cut off any crossing or over-crowding branches then continue to remove any secondary branches throughout the canopy. Only prune in the dormant season and never in spring. Pruning during spring can create entry points in the wood for insects which may lead to disease.